If a reveller goes to Glastonbury and doesn’t document the entire experience exhaustively on social media, were they really there? The answer, of course, is no, which creates a special challenge for the normally semi-dormant mobile networks serving darkest Somerset. For the past few years EE has made a point of trying to confront that challenge by creating a special temporary mobile network for the occasion, from which it in no way seeks to gain any marketing capital whatsoever, honest. Telecoms.com got an exclusive insight into what goes into this one-off gig for EE and the numbers involved. For every year since 2013 the volume of mobile data traffic over its network from the festival has more than tripled: 0.55 terabytes in 2013; 2.5 in 2014; 8 in 2015 and 25 in 2016. EE is forecasting around 40 terabytes this year, which seems on the low side considering the precedents and has added a permanent base station site to its five temporary ones. It comes as no surprise to hear that video – both uploads and consumption – is the main reason for this spiraling demand on the network. 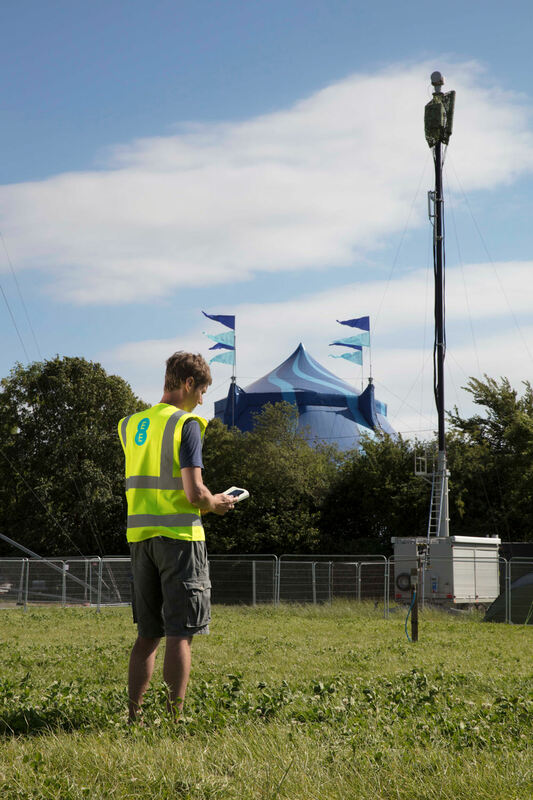 EE has approximately a third of UK mobile subscribers and Glastonbury sells 135,000 tickets each year. If we round that up to 150k to account for staff, etc and give EE a third that means each of its subscribers is expected to consumer 800 MB over the weekend. That might not seem a huge number but if you extrapolate it to a whole month you get 8 GB, which is surely well above normal consumption. We spoke to EE’s Head of Special Projects, Adis Omeragic, to get the juicy tech details on how his company goes about tackling this project. “This year, we’ve added two new fibre links to provide higher capacity backhaul than the microwave links we’ve used in previous years,” he said. “You can have all the spectrum capacity in the world, but a congested backhaul link will slow everything down for your customers. That’s true no matter where you are in the world, and it’s why fibre is such an important part of mobile operators’ futures. “We have three carrier aggregation on 4G on all sites – that’s using a total of 55 MHz of 1800 and 2600 spectrum. And we upgrade the capability of the base stations at each site, increasing the processor capability to manage the uplift in network requests. “Rather than increasing the number of towers we have, we increase the number of sectors on each site. So instead of a single, omnidirectional site, we split the site into as many as 12 sectors, so that each sector of the coverage area gets the full spectral capacity. We’re effectively getting up to 12 times the usage from the same spectrum and the same tower. “With beam forming, we can be increasingly targeted with where we point our coverage. It’s vastly more complicated as a design, but it’s the only way we can stay ahead of the demand. It also allows us to be more specific in where we increase capacity. This reveals the real issue: the spikes around major performances. What’s the point of wallowing in quicksand for three days if you can’t then gloat about being within a mile of Ed Sheeran over social media with a video selfie to prove it? Even EE can’t resist taking Glasto selfies, as the photo taken earlier this week below shows.